These are the opening words of the acceptance remarks of Sir Roy Calne, Professor Emeritus at Cambridge University, after it was announced last month that he and Professor Thomas E. Starzl, of the University of Pittsburgh, would share the 2012 Lasker-DeBakey Clinical Medical Research Award “For the development of liver transplantation, which has restored normal life to thousands of patients with end-stage liver disease”. It’s an award that is well deserved by both Calne and Starzl, since not only did their work help to prove within a few years that kidney grafts “be done” (for which Joseph E. Murray, E. Donnall Thomas were awarded the Nobel Prize in Physiology or Medicine in 1990) but they then went on to show that the liver, considered to be a more difficult organ to transplant due to its greater complexity, could also be transplanted. As a consequence of the work of Calne and Starzl more than 50,000 people are alive today who would otherwise died from end-stage liver failure. The Lasker Foundation have produced an excellent video to accompany the awards, which includes interviews with both scientists, and can be viewed on their website here. And how did animal research contribute to the development of liver transplant surgery? Well, the truth is that it would take too long to detail in this post all the key contributions that operations performed on dogs by Thomas Starzl made to the development of the surgical techniques required, and the animal studies undertaken by both Calne and Starzl that allowed them to develop the first immunosuppressant therapies to prevent rejection. To learn about how they moved from the lab to the clinic and then back to the lab again you can read the award description, which also highlights how transplant survival improved dramatically after the introduction of improved immunosuppressants. These included Cyclosporin A, discovered through studies of immunosuppressant activity in mice by Jean-Francois Borel at Sandoz Laboratories, and Campath-1H/Alemtuzumab, a humanized rat monoclonanal antibody whose development by Hermann Waldmann and colleagues at Cambridge University was prompted by studies in mice, dogs and monkeys, and whose subsequent development relied heavily on studies in mice. 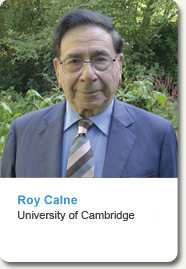 If you would like to know more, Professor Calne has written a lively essay on his work transplants entitled “It can’t be done”, while Professor Strazl’s perspective on their work and the insights into the functioning of the immune system that they gained is titled “The long reach of liver transplantation”. Both essays are well worth reading, and highlight an important fact; animal studies alone can’t perfect a therapy, and neither can clinical studies, it is the close interplay between the two that leads to breakthroughs in medicine. 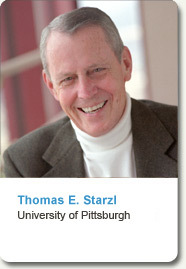 As we congratulate Sir Roy Calne and Professor Thomas Starzl on winning this prestigious award, it is worth remembering that animal research continues to make a crucial contribution to the development of new transplant techniques, from the bioengineered tissues that are beginning to transform transplant surgery, to the spermatogonal stem cell transplants that we discussed on this blog only last week. Posted on November 8, 2012 June 5, 2015 by EditorPosted in News, Science NewsTagged animal research, dog, immunosuppressant, kidney transplant, Lasker Award, liver, organ transplant, transplant. Previous Previous post: Why do we use Genetically Modified animals? What strikes me is how diffiicult and complex it was to solve all the problems related to liver transplantation: not only the surgical technique itself, but also how to limit the body’s immune defenses against the “foreign” tissue. It is truly miraculous that they succeeded.